Even though the book had been on my reading shelf for almost a year, I read it just in the last few weeks, well after the election. I previously read Obama’s other book, the Audacity of Hope. All while reading Dreams from my Father, thoughts kept flooding in, and as I am now trying to write a review in my usual manner, I find that I have so much to say, I don’t know where to start. Obama wrote Dreams in the early 1990ies, just when he had finished at Harvard Law School. He was about 33 years old, and at the time he had no idea that he was going to be a politician. The book first came out in 1995, and was again issued in 2004, along with his second book. He was invited to write the book after he became the first African-American editor of the Harvard Law Review. I guess the publisher recognized that he had something to contribute on the subject of race. When the book first came out, the reviews were mildly favorable, but sales were lackluster and he went about his life realizing that his career as an author would be brief and insignificant. Of course, we all know what happened then. There is a preface to the 2004 edition, written by Obama, which puts some perspective on the book. At that time he was US Senator-elect. In Dreams, Obama describes his heritage and childhood. Even though his family roots were fractured and diverse, he definitely knows more about his roots than I do about mine. He describes how both of his sets of grandparents lived, how his parents came to meet, his early childhood in Hawaii, his elementary school days in Indonesia, his high school days back in Hawaii, college in Los Angeles and New York, work in New York, and later in Chicago, and finally his travels to Africa before returning to law school at Harvard. We follow him through his early life, and the only thing missing is a step by step chronology that actually shows dates of when things happened. I am sure he has that chronology, but it would not make sense in the biography and study that this book is. The future historians and biographers will put it all together for us, I am sure. No matter what his political enemies say when they say he’s not black enough, Obama is more African-American than most African-Americans. He has full first generation roots in Kenya that go deep. He has a large family in Kenya. Obama is ‘as black’ as you can get with a black father and a white mother. To the critics, Obama says he cannot tell he is not black enough when he stands in front of a hotel and people toss him their car keys, or when he is trying to hail a cab himself. He is black enough then. 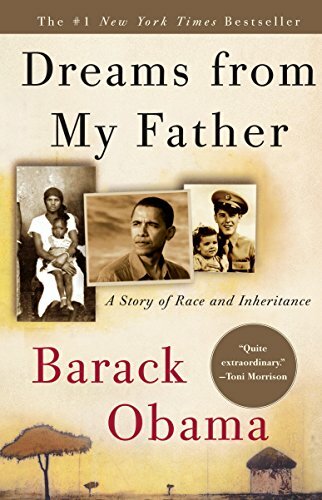 Obama’s father was a piece of work, and I have the feeling that he put him in a more favorable light in this book than he might deserve by my judgment. No doubt, he was a bright and ambitious man, who had his start working as a goat-herder for his very strict and somewhat eccentric father, Obama’s paternal grandfather that ended up as a Harvard Ph.D. He grew up in a very remote village where tribal traditions still ruled. For example, Obama describes that when he lit a cigarette, his great-aunt didn’t recognize a cigarette lighter and asked where the fire came from. This was in the early 1990ies. This illustrates how backwards the village was and still is. Through his brightness and ambition, Obama’s father made it into a school and eventually, after much struggle, got invited by the University of Hawaii to study. That’s where he met Obama’s mother. What most people don’t know is that at that time he was already married to an African woman and had two children, Roy and Auma. After a couple of years in Hawaii, amazingly talking Obama’s mother and her parents into the marriage, after fathering a son, he abandons the family to move to Boston to attend Harvard. This was not the first or last time that Obama Sr. put his career before his family. Stunningly, he meets a new American woman, Ruth, whom he takes with him to Africa and marries. He has several more children with her. At this point I am losing track of the children and wives. Not surprisingly, Ruth and Barack Sr. have a falling out and he leaves her, only to hook up with more African women and fathering a few more children. I honestly couldn’t keep track. I am sure Obama knows. As a result, Obama has one American half-sister from his mother and her second husband, an Indonesian, and he has a lot of African half-siblings, some of which live prosperously in America now, some of which may still be destitute in Africa. There is no sugarcoating this: Barack Sr. was a polygamist. While we think of a polygamist as a man who has several wives and presumably children with them that he takes care of, Barack Sr. abandoned his former families for the next ones, one after the other. He left a wake of abandoned women and children. Obama only saw his father once in his life, when he came to Hawaii in the early 1970ies, when Obama was about 10, and he stayed for approximately a month. He made this trip less to be with his wife and son, but rather to get over a particularly difficult time in his life. He and the other siblings all call him “the Old Man.” Tragically, when Obama was in his early twenties, the Old Man, an alcoholic by then, drives drunk and dies. This is the background Obama comes from. The book reads like some famous person’s long past biography. I had to keep reminding myself that he is younger than I. At all the crossroads, I would find myself picturing where I was in my life during the passages he describes, and surprisingly, I could follow him along completely in my own life. And the passages were amazingly recent. I also kept thinking that this person I am reading about went on to become the 44th president of the United States, something so stunningly unlikely and unexpected, if I didn’t know it, it would never occur to me. This was not a Kennedy who was groomed for politics. This was not a Bill Clinton, who went to visit the White House and shook Kennedy’s hand when he was 16 years old. This was a black boy, abandoned by his father, raised in difficult and money-strapped conditions by a single mother and then by grandparents, playing basketball in the hood, and excelling in school due to great and loving guidance by his mother and grandparents. We all know that Obama’s grandmother, who had a very significant impact on him, died the day before the election. She never saw him win. By then, all his other grandparents had long passed, as did both his mother and father. None of the people who gave him the right stuff to achieve that success, both in terms of genetics and more importantly, in terms of character and discipline, would ever know about his success and never see him inaugurated as our 44th president. The fact that Obama stands alone in the spotlight of this success, with all his ancestors never knowing, makes me truly sad. No wonder Kenya’s president declared a holiday. Obama is an amazing person, and the more I learn about him, the more impressed I am. His accomplishments, compared to the odds working against him, are phenomenal.